Happy Thursday! I hope you had a great Halloween! The temperatures are quickly dropping and I’m loving this coat and this sweater combination for a cozy fall look! I’ve paired them with my favorite pair of jeans that are easy to wear not matter what the season. 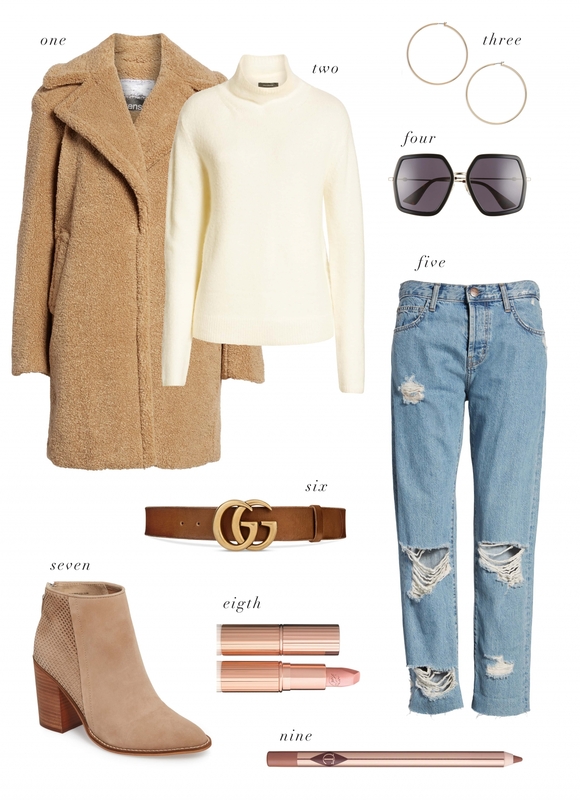 Add a few accessories like a belt and booties and you have the perfect look to enjoy the rest of this gorgeous fall weather while it lasts. Love ♥️these comcy cozy Fall outfit looks … very lovely as always! Love this cozy outfit! So chic! I seriously love this classic look with that DISTRESSED denim!!! Also you and DREW looked amazing at Emily’s halloween party! So clever that costume and not to mention chic!! I love following you and can not wait until you do more of your home reveal!! EEEK! I love the cozy fall look. The coat in particular looks like it would be so warm and comfy. A perfect outfit for cooler weather.